Antibodies To 1918 Flu Found In Elderly Survivors In the journal Nature, scientists report the antibodies were found in 32 people who were alive in 1918 and were able to protect mice infected with a variant of the 1918 virus. The discovery is helping scientists understand what it might take to battle a modern flu pandemic. 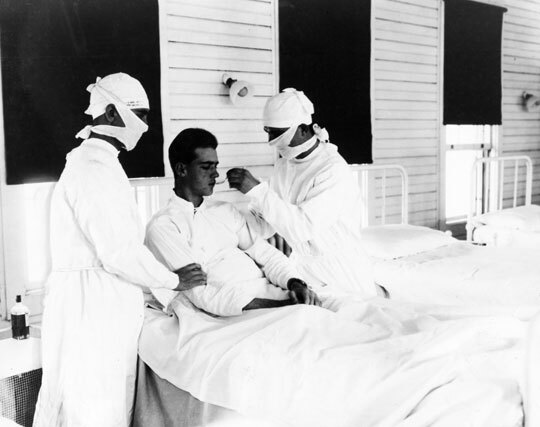 Doctors treat an influenza patient at the U.S. Naval Hospital in New Orleans in 1918. Researchers have found antibodies to the 1918 flu virus in 32 people who were alive in 1918. In 1918, a devastating influenza virus swept the world, killing tens of millions of people. Researchers have just discovered a relic of that pandemic: antibodies in some of the now elderly survivors. The antibodies are helping scientists understand what it might take to battle a modern flu pandemic. One night four years ago, things were a little slow for Dr. Eric Altschuler, so he turned on the TV. Altschuler, with the University of Medicine and Dentistry of New Jersey, was doing an overnight rotation in the hospital that night. He tuned into a now-defunct TV show called Medical Investigation, which featured epidemiologists who study disease patterns. In that episode, several people in a Virginia town came down with a particularly lethal form of the flu. "One of the curiosities on the show was that the oldest person in town, who was the chauffeur for the first person who got the disease — he didn't get sick. Which is unusual, because usually if you're that old — he was, I think, close to 90 — you get sick," Altschuler said. The fictional TV doctors figured it out: The new flu was a variant of the 1918 flu, and the old chauffeur still had antibodies. "As other people started getting sick, they asked him if he could donate some of his blood [so] they could recover antibodies that might help his wife and other people from the town who had gotten sick," Altschuler said. Altschuler figured maybe the TV show was on to something. "Since I saw the show, I thought this is such a great idea, why don't we just do it in real life?" Altschuler, a specialist in rehabilitative medicine, called the National Institutes of Health to see if anyone was interested. Someone there put him in touch with some top virologists and immunologists, including James Crowe of Vanderbilt University. "We had thought about this before but considered it impossible," Crowe said. The cells that make antibodies weren't thought to circulate in the blood for 90 years, at least not at a high enough concentration to be found. But Altschuler was persistent. He found 32 people who had been 3, 4 or 5 years old in 1918 and sent their blood samples to Crowe and the other immunologists and virologists. "We actually had to find the cells floating around in the blood as if they were sentinels looking for a new infection," Crowe said. And using some sophisticated new techniques, they found antibodies to the 1918 flu in every one of the 32 people they tested who were alive in 1918, and few if any antibodies in anyone born after 1925. Finding the antibodies "suggests that it's possible to make a strong immune response in humans to these types of bird flu viruses," Crowe said. One type of bird flu virus now circulating in Asia has sickened or killed hundreds of people. Researchers worry that that virus, with a few more mutations, could become highly infectious like the 1918 virus. The researchers next wanted to make more antibodies to see if they could still keep someone from getting sick. "If you take the cells that make these antibodies and you can treat them in a way to allow them to grow in culture dishes for a long period of time, you can then isolate those antibodies and use those antibodies to treat somebody with a severe infection," said Jeffrey Taubenberger, a 1918 flu virus expert with the National Institute of Allergy and Infectious Diseases. Once the researchers engineered the 1918 human cells to manufacture antibodies, they gave them to mice infected with a modern version of the 1918 virus. The mice who got the antibodies didn't get sick, the researchers report today in the journal Nature. But mice aren't people, and the 1918 virus isn't likely to be the next flu pandemic. Making these antibodies is also difficult and slow; vaccines are somewhat faster and easier. So what good is all this? It's nice to have an alternative when you're looking at something as potentially deadly as a flu pandemic, Taubenberger said.